The Local Government Program Alumni Society was Awarded to the Spirit of Western Award at the Alumni Association Annual General Meeting. Western's Local Government Program Alumni Society is pleased to announce their 2016 Annual Conference being held November 16, 2018. This year's theme is Local Government Interrupted with Keynote Speaker Jesse Wente. For more details visit our Alumni Conference page. This term, Local Government Management Course students will be supporting the City of Sarnia with policy research and analysis under the supervision of Zac Spicer. The next edition of the Local Governance Seminar Series will feature Professor Bill Irwin of Western University. It is with deep sadness that we announce the passing away of Dr. Bob Young. Bob was a gifted teacher and scholar, and a mentor and dear friend to many. While his impressive body of work will shape our discipline for decades to come, it was his commitment to strengthening our department and his willingness to help his colleagues develop as full members of the academy that will be remembered most. Bob was a distinguished scholar, great mentor, and friend. We in Political Science wish to send our heartfelt condolences to Bob’s Wife, Louise Gadbois, and family, at this extremely sad time. Bob will be missed dearly. The Local Government Program is pleased to announce Professor Joe Lyons as the new Program Director as of July 2017. Joe has taught in the program since 2013 and has a strong appreciation for its unique and important role in training local government administrators. We would like to thank Martin Horak for the last 7 years of service in this role. The Local Government Program is proud to announce the publication of the Municipal Resource Guide to Leading Practices in Cost Savings. This Guide, which features case studies from around Ontario, was developed by team of researchers headed by Andrew Sancton and Martin Horak, with support from the Ontario Ministry of Municipal Affairs. "Municipal Resource Guide to Leading Practices in Cost Savings"
Professor Zack Taylor has been appointed to a Task Force on improving deliberation and decision making at Toronto City Hall. Launched by the University of Toronto's School of Public Policy and Governance, the task force will propose reforms that City Council can act on quickly, without any major legislative or regulatory changes, under powers afforded by the City of Toronto Act and other relevant statutes. A final report will be released in April, 2017. Other task force members include former Toronto city managers Joe Pennachetti and Shirley Hoy, and former councillors John Parker and David Soknacki. Western's Local Government Program is pleased to announce that Dan Mathieson, the Mayor of Stratford, Ontario, has joined Western University's as the 2016 Distinguished Practitioner in Residence for its Local Government Program. Mayor Mathieson is the second Distinguished Practitioner in Residence following on a successful year by Former London, Ontario Mayor Joni Baechler in the role. Learn more about Mayor Mathieson [click here]. Western's Local Government Program Alumni Society is pleased to announce their 2016 Annual Conference being held October 28, 2016. This year’s theme is Street Level: Connecting Government to Community with keynote speaker Sam Tsemberis. Western's Local Government Program is pleased to annouce that Joni Baechler, the former Mayor of the City of London, has joined Western University's as the first-ever Distinguished Practitioner in Residence for its Local Government Program. Western's Local Government Program Alumni Society is pleased to announce their 2015 Annual Conference being held November 6, 2015. The theme is Back to the Future: Exploring What's Ahead for Local Government and a keynote speaker will be annouced soon. Stay tuned for details. The Local Government Program continues to be a premier provider of Public Administration education to local government officials. We are pleased to announce that the London DPA program has not only be renewed, but expanded to include two more students. This will again include two DPA/MPA courses taught on site at London City Hall. The London DPA Program compliments our three already successful DPA programs on campus, at the City of Toronto, and with a consortium of GTA municipalities (Richmond Hill, York Region, Newmarket, and Duhram Region). Western's Local Government Program Alumni Society is pleased to announce their 2014 Annual Conference being held in November. The theme and keynote will be annouced soon. Stay tuned for details. The Local Government Program continues to be a premier provider of Public Administration education to local government officials. We are pleased to announce that the pilot project to provide a DPA for selected City of London employees has been renewed for another year. This will again include two DPA/MPA courses taught on site at London City Hall. Western's Local Government Program Alumni Society is pleased to announce their 2013 Annual Conference being held on November 8th. This year’s theme is The Creative Spark - Public Service Innovation. The keynote speaker will be TTC Chair and Toronto City Councillor, Karen Stintz, BA’92, Dip’93. For more information, please see the Alumni Conference webpage. Photo: Professor Sancton is the sixth from the right in the back row. Professor Sancton was a plenary speaker at the Third International Conference on Local Government in Khon Kaen, Thailand, November 15-16, 2012. Drs. 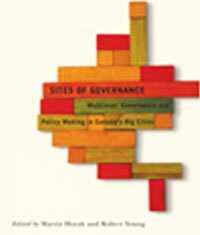 Bob Young and Martin Horak have co-edited a new book entitled: Sites of Governance: Multilevel Governance and Policy Making in Canada's Big Cities. (McGill-Queen's University Press, June 2012). Congratulations Bob and Martin! See More. Drs. 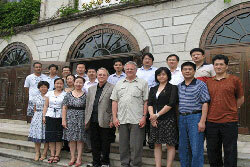 Bob Young and Andrew Sancton with students in front of the Xiamen's University of China June 2011. Drs. Bob Young and Andy Sancton taught courses on policy process and local government to part-time students in the MPA program at Xiamen University in China from May 30 to June 2, 2011. Their trip was funded by the Dr. David S. Chu Program in Public Administration, China. Professor Andy Sancton has just published a new book, Canadian Local Government: An Urban Perspective (Oxford University Press, 2011). It has been praised as "excellent, written at just the right level in a highly readable style." Oxford University Press accurately describes the book as "the essential text on municipal government in Canada." Congratulations on this fine achievement, Andy! On December 16, 2010 Josh Morgan, the Recruitment and Development Officer for the Local Government Program, was elected Chair of the London Public Library Board for 2011. Josh was first appointed to the board in 2006 and was recently re-appointed by London City Council to a 4 year term. Aside from his involvement with the Library, Josh also serves as the Vice-President of the Western Fair Directors, where he chairs the Budget Committee for the annual fall fair. We are delighted to announce that Professor Martin Horak has been nominated for the prestigious SSHRC Aurora Prize for 2010. This $25,000 prize recognizes an outstanding new researcher who is building a reputation for exciting and original research in the social sciences or humanities. The winner will be announced later this year. Congratulations for your nomination, Martin. Local Government Program instructors, Josh Morgan and Ursula Stelman along with their students take a break between classes at Xiamen University in China in June 2010. Instructors Ursula Stelman and Josh Morgan travelled to China to teach the final two courses for the first cohort of students in the David S.H. 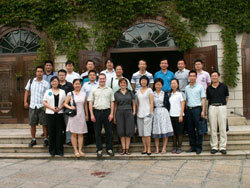 Chu Public Administration Program in China. Over the past two years, Local Government Program instructors have taught four courses to Chinese local government officials and students in Xiamen University’s MPA program. Stelman is a former Director of Community Services for the City of Winnipeg. Josh Morgan is the Recruitment and Development Officer for the Local Government Program at Western. All four classes were very popular with the Chinese students and discussions about a second round of classes are in progress. Teaching in China is just one component of a donor funded agreement that also includes collaborative research, faculty fellowships and international scholarships to attend Western’s MPA Program. We are proud to report that Professor Bob Young’s Tier 1 Canada Research Chair in Multilevel Governance has been renewed for another seven years. For more on Professor Young’s innovative and important research, see Canada Research Chair in Multilevel Governance and Canada Research Chairs. 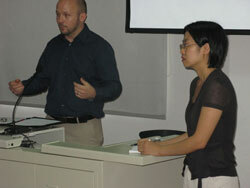 In this picture, Professor Tim Cobban is shown with "Alice" his expert sequential translator as he teaches a course about Canadian local government to local officials and students at Xiamen University in China. The course runs from May 18-22. Andy Sancton's book, The Limits of Boundaries: Why City-regions Cannot be Self-Governing, has been short-listed for the Donner Prize for the best book on Canadian public policy in 2008. The Donner Prize is awarded annually by the Donner Canadian Foundation.